Blackjack is popular gambling game both offline and online. How to play blackjack is about beating the dealer and getting as close to 21 as possible, which is where it gets its other name from. The popularity of 21 comes from the fact that South African players have greater odds against the house and can win large amounts of money. 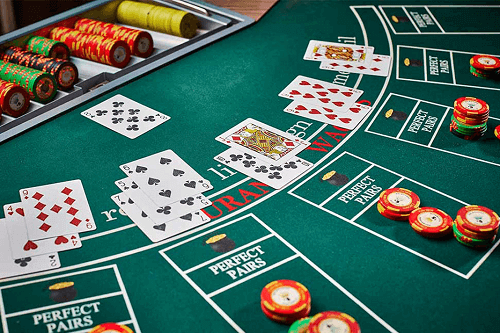 In this how to play blackjack guide, we’ll introduce you to the basic concepts of blackjack, what you should expect from an online blackjack table, and some tips on how to play blackjack the best. Read on to find out more about this game and where you can find the best free online blackjack games. There are about 30 different versions of blackjack out there and players can find nearly all of them at their favourite South African online casinos. As mentioned earlier, the point of 21 blackjack is to get a hand that’s higher than the dealer’s but without going above 21. Consequently, if that happens, you bust which means lose. Online blackjack is similar to casino blackjack but the dealer is a random number generator (RNG). Alternatively, there’s live-dealer blackjack. Basically, this is a live streamed game of blackjack with a human dealer. 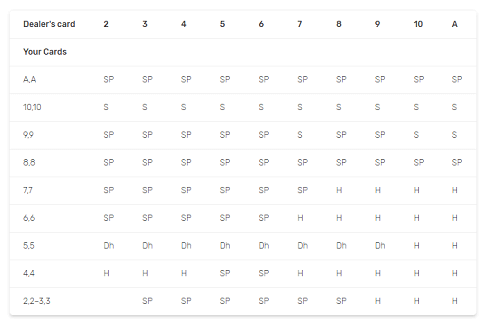 Let’s take a look at what an online blackjack table looks like. The difference in learning how to play blackjack online is that the chips and cards are buttons on your screen. They may differ from one casino game to another but expect to find the following. Account balance: this is the amount of money you have in your account. Betting box: you place your chips and get your payouts here. Clear button: this is to clear your bet and place a new one after a hand is complete. Deal button: this begins the dealing of a hand. Sometimes, you may not see this button until you place a bet. Double button: use this button when doubling down. Hit button: this button requests more cards once you’ve been dealt your first two cards. Stand button :this is for when you don’t want to be given more cards. Additionally, it also tells the “dealer” to draw their cards. This button may only be on screen once a hand has been dealt. Split button: this is for splitting your identical cards into two hands, giving you the chance to draw against each hand. Therefore, this doubles your bet and equally your chance to win more. Table limit: this displays the minimum and maximum bet you can make on one hand. In learning how to play blackjack, remember the suit of a card in blackjack doesn’t matter. The card values in 21 blackjack are simple –the number on the cards is the value of the card e.g. a seven is equal to seven points. The Jack, King, and Queen (face cards) are worth 10. On the other hand, Aces have a value of either one or 11. Which one you choose depends on the rest of the cards in your hand. Choosing an Ace that equals 11 makes your hand “soft”. Conversely, choosing an Ace that equals 1 gives you a “hard” hand. This means that you can ask for another card i.e. hit without the chance of going “bust” i.e. losing. While the final amount you are paid out depends on the amount you bet, the way you beat the dealer will reward you with higher or lower winnings. If your hand is closer to 21 than the dealer’s, your winnings are paid one to one. The same applies if the dealer busts. Getting blackjack with your first two cards (the combination of an Ace with any 10), means you get a payout of three to two. If a completed hand is equal to that of the dealer’s, the outcome is called a “push”: you can take back your bet. Likewise, this happens when both you and the dealer get blackjack in the same round. There are hundreds of blackjack variations, each with their own betting and payout system. But most online versions use these as standard payout rules. 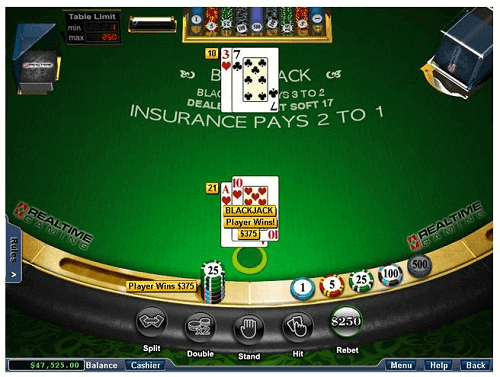 Now, let’s take a look at how you play blackjack online. Select a denomination/amount by clicking on the chip. Click on the Betting Box where the chip will appear. To increase your bet, click on the Betting Box again and another chip will come up. If you change your mind and want to change your bet, click on Clear and begin again. Click on the Deal button and the dealer will hand out the cards. Take note of the dealer’s face-up card. Online blackjack offers the added convenience of showing the point value of their cards without the need to calculate it for themselves. Decide whether you will click Hit, Stand, Split, or Double. If the dealer has a face-up Ace, you have the option to take Insurance. Click Yes or No depending on what you want to do. Once you’re happy with your points, click on Stand to begin the dealer’s turn. When the dealer is done with their turn, you’ll have only three possible outcomes: win, lose, or push. If you win, the screen will tell you how much you’ve won. Losing means the dealer’s hand won and it will display that. If it’s a push, you and the dealer tied and your bet will be returned. 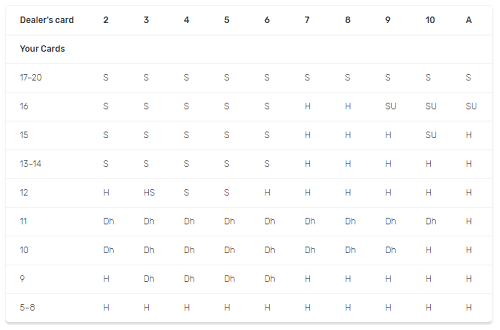 The table will either clear automatically or you’ll have to click on clear to start again. either you will choose your wager again or use the Repeat button (if there is one) to play the same bet. Know what to do when you’re dealt a certain hand, especially compared to the dealer’s hand. If you’re dealt a total of four to eight, always opt to Hit. However, if you have 12 to 16 and the dealer’s up card is also low, opt to Stand. The dealer has to make decisions you don’t, so let them go bust if they’re forced to. They’re at a disadvantage if they get cards from two to six – they’re more likely to go bust with these cards. Alternatively, if you’re dealt 12 to 16 and the dealer has a higher face-up card – seven to Ace – choose Hit and get as close as possible to 21. You may go bust but your chances of losing are high any way. Having a copy of an online blackjack strategy chart helps. If you get 21 and the dealer has an Ace face-up, don’t take Insurance. You’ll be better off winning three to two on your blackjack than betting more money on if the dealer has blackjack. When doubling down, you are allowed to double your bet after getting your first two cards. You’ll then only get one card on your hand. Most casinos allow players to double down on any two cards. Making this move is recommended, especially if the dealer has a two, three, four, five, or six because they’re more than likely to go bust with these up cards. This is incredibly difficult to do, especially if there are eight decks circulating in one game. Furthermore, counting cards is impossible with online blackjack because the game uses an RNG which is difficult to predict. Keep in mind the number of card decks in use during a game. In learning how to play blackjack, it’s important to remember that the more decks in play the higher the house edge – the advantage the casino has over you. A single deck game has a house advantage of 0.17% while an eight-deck game has a 0.65% advantage. Most people playing online blackjack use a strategy chart, which helps when you’re learning how to play blackjack. The charts have three different factors – the dealer’s face-up card, your hand, and what move you should make. To find the best blackjack game where you can play for fun or for real money, visit one of our recommended casinos. They have a wide variety of titles where you can play blackjack on mobile, through your web browser, or using their high-quality casino software. South Africans can learn how to play blackjack online at the comfort of their homes through a computer game or live-dealer version before taking on the excitement of a land-based casino.